On March 20th 2011, the Ichikawa-Ha Goju-ryu International Karate-do Sosui Kai held its semi-annual gasshuku at the Goshin-Kan dojo in Merrick, NY. 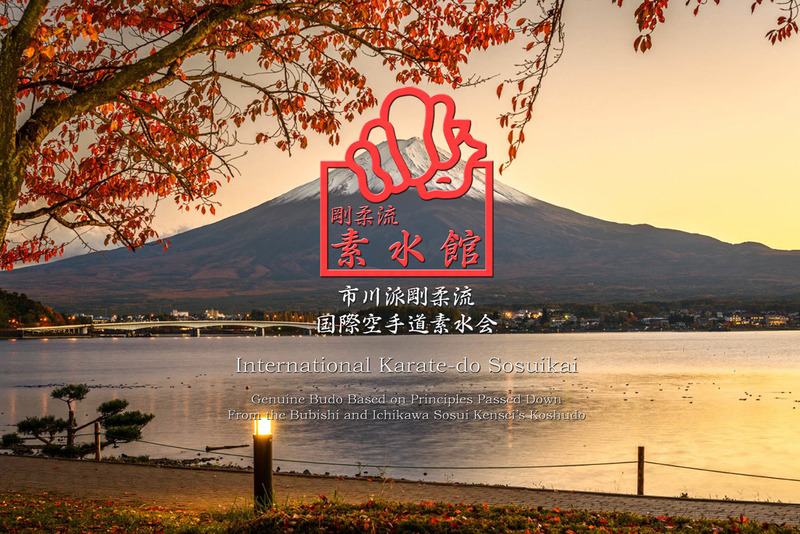 The gasshuku was conducted by R. Choji Taiani Sensei and included members of the Hombu dojo as well as participants from the Philadelphia and New Jersey branches. Taiani Sensei opened the day with incense and a tribute of remembrance to the late Ichikawa O-Sensei, followed by a heartfelt message to everyone about the tragic events unfolding in Japan, namely Sendai, the seat of the All-Goju-ryu tournament and the home of Mr. and Mrs. Chiba Kenjiro Sensei. Taiani Sensei and senior student together with Mr & Mrs. Chiba Kenjiro Sensei. Gasshuku training began with Taiani Sensei leading the group through Da Mo Taiso techniques. These techniques were formulated to touch upon every muscle group in the body are used for stretching, warming up and fostering energy within the body. 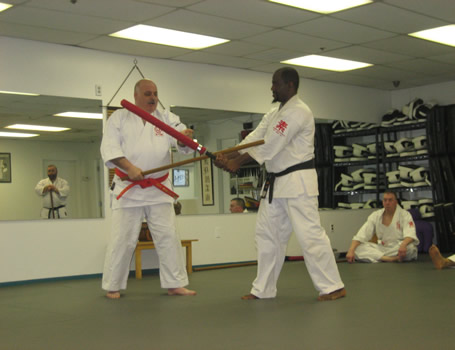 Kobudo – The group worked on Ichikawa Sensei’s Jo Kata and a very rarely seen form of Kobudo called Jiffa Jutsu, in which the practitioner implements hair pins as a self-defense weapon. Taiani Sensei demonstrates several Jo Jutsu techniques including Tai Sabaki followed by an attack to the opponent’s hands. Aiki Ju Jutsu – The joint-locking and throwing aspect of Ichikawa Sensei’s Budo. This was introduced at Gasshuku as an extension of our Ippon Kumite. Taiani Sensei has stressed on several occasions that although very basic, most forms of commonly practiced kumite, such as Yakusoku, are relatively futile because the opponent is not incapacitated. With the addition of Ichikawa Sensei’s principles, a seemingly basic exercise becomes a true demonstration in self-defense. The year 2010 Marked Taiani Sensei’s 50th year of continuous training and teaching of Karate-do. Although Ichikawa Sensei was, and to an even greater degree, still is his teacher, over those many years, he has trained with and met the acquaintance of some of the most influential individuals to ever grace a Karate Dojo. Below are a few of the wonderful letters received in celebration of this special event. Taiani Sensei has been working very hard to popularize Goju-ryu Karate-do in America. His accomplishments are excellent. I would like to salute him as a representative of the Nihon Karate World and birthplace of Karate-do. I would like to thank him for having a demonstration in honor of the second anniversary of Ichikawa Sosui Sensei’s death, who is Hanshi and Taiani Sensei’s teacher. It has been fifty years in history since Taiani Sensei started to practice Karate-do. I am glad to hear that he is going to issue a booklet to celebrate this occasion. 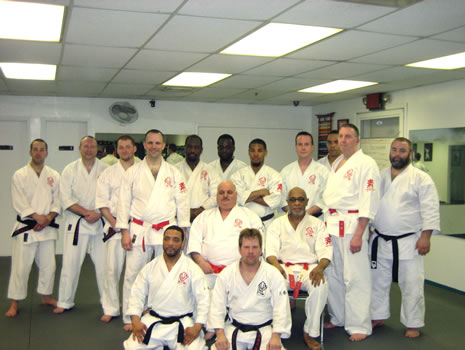 Taiani Sensei and his students have attended our All-Japan Goju-ryu Karate-do Championship numerous times. I would also like to thank them as the Godaime Soke of Nihon Goju-ryu (as the Fifth Generation Grandmaster of Nihon Goju-ryu). There was sadness in Taiani Sensei’s long teaching history. One of his students, Mr. Michael Mullen, who was a Nidan, became a victim of international terrorism while he was on duty rescuing people after the attacks on the World Trade Center. His devotion, brave actions and responsible work are very honorable. I also express my respect to Taiani Sensei who trained such a brave man, Mr. Mullen through Karate-do. Taiani Sensei, please take care of yourself and continue your efforts to raise strong men like Mr. Mullen. Congratulations on the 50th anniversary of your illustrious career as practitioner and teacher of Goju-ryu Karate. I send my sincere appreciation for your continuing efforts to foster knowledge and understanding of true Japanese Budo in the West. Your dedication and pursuit of excellence have inspired thousands of students and fellow karateka around the world. As teachers we strive to set an example worthy of our respective traditions, and in your journey of half a century, you have shown the true spirit of renma, the continuous polishing of our inner selves that is at the heart of our practice. Please continue to share your strong spirit, and from all of us at World Seido Karate Organization, we send our warmest regards to you, your family and your wonderful students. I would like to offer my congratulations to you on the occasion of your 50th anniversary in Karate-do. In traditional Karate-do, it is important to study not only to punch and kick but also throwing, breaking joints, breathing and being aware of distancing. It contains not only thinking of oneself and opponent but also thinking of one’s inside and outside (mind & body). I started to train at the Sosui-kan when I was eighteen years old. For the last five years of Ichikawa Sensei’s life, until he passed away, he earnestly taught me the esoteric (secrets) of traditional Karate-do which he hadn’t shown before. Now, I have been training Ichikawa Sensei’s esoteric Goju-ryu Karate-do; “Nippon Koshudo” following his will as “Ichikawa-ha Goju-ryu Karate-do Shigaku-kan. I know Taiani Sensei trains and teaches Koshudo earnestly. In October 2009, Taiani Sensei and his students came to my dojo in Japan to train together with us. I was impressed at that time because every student trained much harder than I had anticipated. I hope Taiani Sensei and his students will keep studying Ichikawa Sensei’s Karate-do. I would like to extend my most sincere congratulations and gratitude to Taiani Sensei and all his students of the Soto-kan and Tenken-kan. Omedetogozaimashita!!! Congratulations on your 50 years of training, teaching and promoting the art of Japanese Goju-ryu. Your dedication to the art and to your loyal students is a fine example of what the aim of true Karate-do should be. I wish all the best for your continued success during the next 50 years of your Karate-do journey. A half a century ago, a twelve year old American boy walked into a dojo and through that experience, his life was changed forever. He could have never known at the time what a fascinating adventure and intriguing challenge the art of Karate had in store for him. Challenged and changed, karate transformed the boy as he lost the awkward outer garment of adolescence and gradually became a confident, strong and very capable young man. The combination of arduous training and strong traditional values formed the foundation upon which young Bob Taiani would build his character and reputation as a fierce fighter, trustworthy leader and honorable human being. His dedication and contributions are a credit to the art and set him apart from others. If there’s any truth to the expression that tall trees provoke the pride of winds, there can be no question that Taiani Hanshi is amidst the tallest trees in Karate-do. The Research Society has long been associated with scholars, master instructors, and other important personalities of the fighting arts and I am honored to include a master of Taiani Hanshi’s status on this list; it’s a pleasure to be able to share this moment as he looks back over the past fifty years of his life with this wonderful art, Karate. My only disappointment is that I could not be here in person to enjoy this auspicious occasion with him. Bob, thank you for giving us all so much, my friend. Happy Anniversary from down-under, in the Land of Oz. 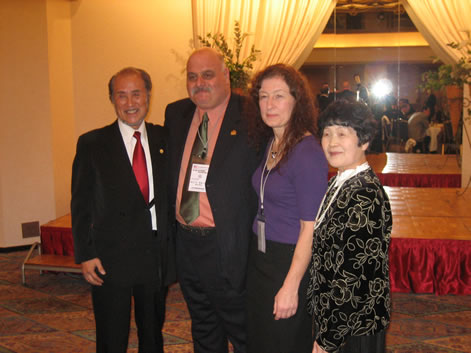 There are many things I could say to honor Taiani Kancho on his 50th year in Karate. Perhaps the best and simplest words would be to say that he in an unparalleled karate teacher and scholar/historian—a man who teaches from the heart with consummate knowledge along with a sense of humor that even makes hard training seem easier. On this, your 50th year anniversary since beginning karate back in 1960, I wish you 100 years of health and happiness: “Cento anni di salute e felicita!” (That final wish is for the Brooklyn Italian in you). Hanshi, congratulations on your achievement in devoting Fifty Years to your pursuit of knowledge, spiritual confirmation, and the ability to meet with the best teachers in the martial arts. We have shared many adventures together and you have given me guidance, inspiration, and perception to enable my 45 years of training in Matsubayashi Shorin-ryu under Ansei Ueshiro Tan Mei. I look forward to our conversations and opportunity to compliment my own training and search of Budo. Please enjoy your celebration in the Year of the Tiger. As most accomplished student of the Bubishi, you will add many pages for future Bubishi to follow. Good luck in your quest!